AppChina.com, a third-party Android app store, claims it has recorded remarkable profits, maintaining sustainable growth momentum this year, the company’s CEO Yuan Cong said at an interview. Yuan added that more than 50 percent of the company’s revenue was attributed to mobile games (source in Chinese). As one of the incubation projects in Kai-Fu Lee’s Innovation Works, AppChina.com was founded in 2010 and finalized Series A financing in 2012. It hosts more than 640,000 apps and has well over 30 million users. 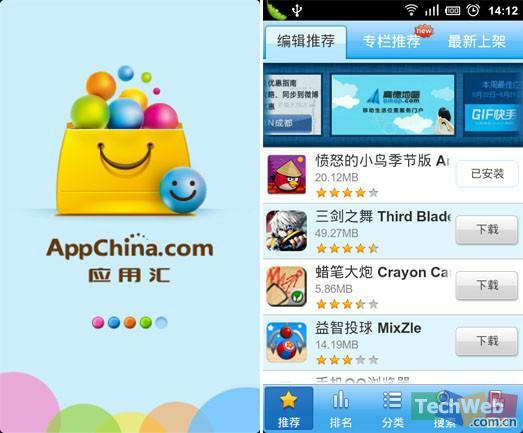 The company’s commercialization model has been questioned for mimicking the App Store model in Chinese market. It has tried nearly all the business models available in the startup period, such as software distribution, Advertising SDK, paid electronic books, app campaigns for brands, among others. But none of them proved to be successful. With the maturity and popularity of Android system, things were getting better in mid-2012 when mobile games boomed. After making in-app payments available, the company started hosting third-party Android games and taking revenue shares. Yuan pointed out that the company’s future focus is to perfect its products and enhance investments in research and development.